Mileage - 170 miles from Lauwersoog (Netherlands) to Cuxhaven (Germany). Before I tell you about today I just want to make comment about how many cycle tracks there are here, but not only in this area (Lauwersoog) of the Netherlands, but all over - and just to demonstrate all the red and blue in the screen shot are mostly off road cycle ways! Anyway, back to today and I haven't really got much to say! We left our cosy Marina pitch knowing our journey would be a long one - about 174 miles that would mostly be on toll free motorways. The first 62 of them were in the Netherlands with far reaching views over flat agricultural land with just an occasional windmill to break up the vistas. Then the rest was over the border into Germany, and it was there that we spied our first major traffic issues - luckily on the opposite carriage way! ⛟🚌🚐🚑🚕🚗🚗🚗🚗🚗🚙🚙🚚🚛🚛🚛🚛🚜 - the queue went on for several miles😧😧! I suppose also, to pad this out a bit, I could mention the incident with the dead bodies - they were splattered all over T4rdis2's windscreen! Thunderstorms had been predicted for the afternoon but all we experienced was about 30 seconds of torrential rain but that was good because it helped to rid us of the millions of bugs that were firmly adhered😂😂. Then after that it didn't take us much longer to reach our destination which was the huge Stellplatz at Cuxhaven Port. Once again we've been here before back in November 2016 so everything was familiar and we were very quickly settled in with a brew made and sitting out in the sunshine to enjoy it. And while I was whiling away my time I checked how far we are from our ultimate destination - and it turned out to be just a little 1,740 miles - it's a good job we've got plenty of time to do it in! The Stellplatz was massive and could hold several hundred vans! Monday 14th May 2018 🌞🌞🌞 and very hot! Well, what a night! As I said earlier our present Stellplatz is right on Cuxhaven port side and when we arrived there was a huge ship birthed only about a 100 yards from our pitch - with it's generator's running! Now, that noise was bad enough through the evening - but it also continued all night thus resulting in my being a bit bleary eyed this morning - and when I complained John's reply was 'what noise'! Therefore, an easy day enjoying the lovely sunshine was quickly decided upon and this turned out to be a leisurely stroll along Cuxhaven's sea front promenade which stretches for about 4 miles and where the Wadden Sea washes up onto the shoreline. Nearly all the way we were greeted by fine pale yellow sand along with numerous sitting places and alfresco cafes dotted about for everyone's comfort. Additionally, there are also hundreds of Germany's answer to beach huts - in the form of two seater wicker 'chairs' that can be hired for 10 euros a day and can be locked to store possessions, or when occupied, can be tipped back to make shady sun beds! The Prom which tripled as a walkway, a bike path and a rail link! Our day was quite idyllic really, we meandered along watching the antics of people taking a dip in the cooling water, we picnicked with fantastic views, and when we got back to T4rdis2 in the early afternoon we lazed in the sunshine and watched the world go by! However, it was a bit difficult to chat with our neighbours because I think until evening we were the only 'foreign' van on site, then we were joined by a Swiss couple who tried to explain how wonderful our Scandinavian trip is likely to be! Oh, and the ship - that's gone so hopefully tonight will be much more peaceful. This morning presented with 'a must do' task and a choice concerning our on going journey! The essential job was the restocking of our food cupboards so that we wouldn't starve to death 😂😂, and the replenishing of our wine cellar because were too mean to pay Scandinavian prices. So after leaving the Cuxhaven Stellplatz Mrs Snoopy was programmed for the nearest Lidl and that mission was soon accomplished - equivalent of 50p for beer and £2.50 for a bottle of wine! Then, to get to our next destination we needed to cross the massive River Elbe, so to do that our choice was either to drive 43 miles to Hamburg, cross under the toll tunnel and then drive 43 miles back, or to take the shorter route to Wischhafen from where we could take a ferry across the water to Gluckstadt. We choose the later but as our penance we were required to sit in a mile long queue of traffic, and it took an hour and three quarters before we could board the little shuttle ferry that toos and fros across the huge expanse of water that is the Elbe. However, even if we'd known about the delay beforehand I don't think we'd have altered our plan because the detour to Hamburg would have taken equally as long and would have probably been the more expensive choice of the two. And while we were waiting we did take advantage of that gift of time by scoffing our lunch and admiring the lovely scenery that surrounded us. Some of the thousands of geese that darkened the sky when they flew en mass! However, the delay had set us back, so what should have been a 3 hour journey turned into a marathon 5 hours and by the time we arrived at the WoMoLand Camper stop we were more than ready to put our feet up and chill in the late afternoon sunshine with a nice cold beer! I'm not really quite sure what we were expecting of this place but we very quickly decided that on our own personnel scoring system for camping places this one would get 9.5 our of 10! It's very lovely with spacious divided pitches, excellent clean facilities, friendly (all German) neighbours, lovely views and lots of peace and tranquillity all around - eventually !!! The only thing it lost half a point for was the obligatory mowing and strimming noise that blighted our first half hour! Wednesday 16th May 2018 🌧 (but only a couple of dozen drops! Then 🌞🌞🌞 and Oh what a lovely evening !! Today is another Happy Anniversary to Us - It marks 2 full years of living happily as full time travellers in T4rdis2! But that doesn't include the 9 months we spent in our first T4rdis! In total we've now been on the road for 2 years and 9 months! This morning we left we left the campsite at Nordstand but it was really was quite a shame to be going because it was situated on a little peninsula that seemed to have quite a lot on offer that we hadn't had time to explore! Therefore, another promise has been made - and that's to stay there again on our return journey and try and do what we missed on this occasion. 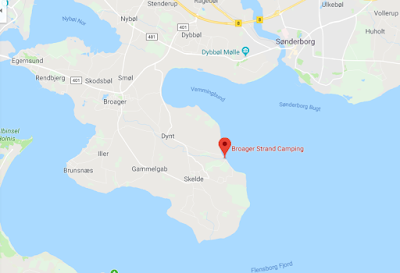 Anyway, we were soon on the road and this time we sailed along without a hitch, and this resulted in us crossing the Danish border after only travelling 31 miles, and although it was manned by armed soldiers we nipped straight through without any problem. Then it was forwards and onwards over an immaculate motorway, and once we departed from that we only had a short distance to travel before we reached our new campsite - Broager Strand which is right on the sea front. Once there we were greeted by the very friendly owner and we were quickly booked in for the next two nights, but what we hadn't realised was that this would lead us up to the Whitsun Bank Holiday, and the owner explained that we should definitely make a forward booking for that period because it was quite likely that most places in this region of Denmark would become fully occupied. Added to this we also needed to consider the fact that wild camping is not possible in this country, so although we hadn't really got a plan for the next few days one needed to be formulated quite quickly!! The site is situated on another peninsula and while we were booking in the owner gave us lots of info about the area and told us about several walks and rides that we could do while we were here - it was all a bit mind boggling really because we hadn't anticipated that there would be quite so much choice in this lovely area. So once lunch had been consumed we set of in glorious sunshine to explore part of a long distance walking path called the Gendarmstien - so called because in the mid nineteenth century the Gendarmes used to patrol the area to watch for dangerous smugglers who illegally moved goods in and out of the country to avoid paying customs duty. The path runs for 84 kilometres in total but we only walked a short part of it that took us up to a view point from where we had 360 degree views of the coastline and the crystal clear waters that surround the peninsula. And it was while we were walking that we decided to stay here a while longer as long as the campsite could fit us in! However, it turned out that our pitch was already booked but if we didn't mind moving on Friday we were told we were very welcome to stay - so now this is home for the next 5 nights!